Home September 1 2015 Vol. 35 No. 15 Feature Articles Noncoding RNAs: A Cache of Cancer Clues? In the postgenomic era, the numerous and diverse noncoding RNA species once dismissed as “junk RNA” are increasingly seen as treasure. Noncoding RNAs, we now know, have diverse functions in health and disease. Some in the field believe that we have only started to appreciate the riches of noncoding RNA. The ultimate jewels? They may prove to be previously hidden connections with cancer. Almost as numerous as newly discovered RNA baubles are the newly organized RNA conferences. One such event, Molecular and Cellular Biology: MicroRNAs and Noncoding RNAs in Cancer, was held June 7–12 in Keystone, CO. This event, a Keystone Symposia conference, focused on the complex universe of RNA biology that is disturbed in cancer. Providing a perspective on the field was John L. Rinn, Ph.D., an associate professor of stem cell and regenerative biology, Harvard Medical School. He said that if you are not reading a new textbook, your ideas about RNA may be wrong. At Weill Cornell Medical College, researchers discovered that estrogen receptors can hijack the androgen-signaling pathway to promote prostate cancer growth. In particular, they found that the estrogen receptor can activate NEAT1, a long noncoding RNA. 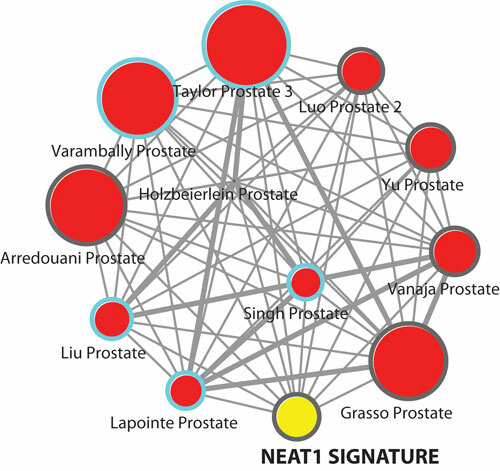 NEAT1 target genes were determined to be upregulated in several prostate cancer datasets. Noncoding RNAs include the well-known microRNAs (miRNAs) and the lesser-known lncRNAs. Usually defined on the basis of their size, the single-stranded short miRNAs consist of about 22 nucleotides. They regulate gene expression via translation inhibition or degradation of their mRNA targets. Long ncRNAs refer to transcripts that consist of more than 200 nucleotides and lack extended open reading frames. This arbitrary cutoff excludes most known, yet still poorly understood, classes of small RNAs, such as tRNAs and short interfering RNAs. The laboratory of John L. Rinn, Ph.D., at Harvard Medical School has been studying the role of large intervening ncRNAs (lincRNAs) in establishing the distinct epigenetic states of adult and embryonic cells and their mis-regulation in diseases such as cancer. The major specific hallmarks of cancer include malignant cell migration, invasion, and metastasis. The latter is the primary cause of cancer recurrence and subsequent death. The team of Sven Diederichs at the German Cancer Research Center DKFZ, in collaboration with the Spector lab, examined the role of MALAT1 by knocking it out in human lung tumor cells. They incorporated an RNA-destabilizing element using zinc finger nucleases. This resulted in a unique loss-of-function model with more than a 1,000-fold silencing. When these cells were utilized in a xenograft mouse model, they found that MALAT1-deficient cells had impaired migration and homing to the lungs. This study supports a role of MALAT1 as a regulator of cell migration that is important in gene expression governing the metastasis of lung cancer cells. These findings have therapeutic implications, according to Dr. Spector. “MALAT1 could represent a predictive marker of disease and use of antisense oligonucleotides could provide a potential therapeutic strategy,” he concluded. To extend these studies, Dr. Spector’s group is now examining how altered levels of MALAT1 might impact breast cancer initiation and progression. 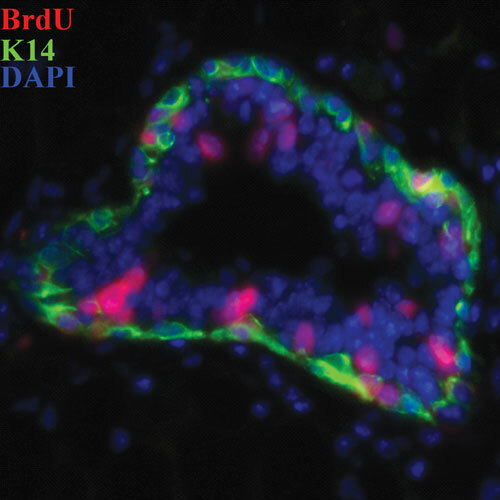 A precancerous lesion imaged at the University of Minnesota shows abnormal duct morphology and cell proliferation in the mammary gland of a 10-week-old mouse engineered with a single copy number increase of Myc and Pvt1. 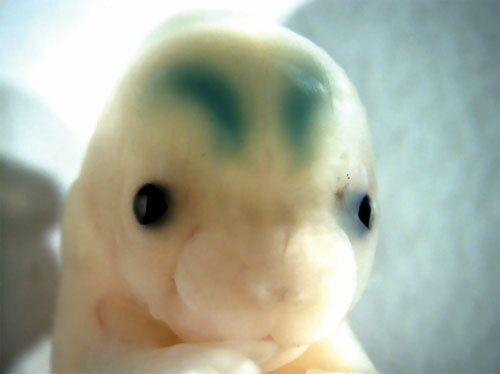 Gain of Myc alone does not produce such a phenotype. One lncRNA, PVT1, is keeping bad company, at least according to new studies linking it to the key cancer-causing oncogene, MYC. This unexpected partnership has stirred up much interest in the scientific community, especially since MYC is linked to a majority of human cancers. Anindya Bagchi, Ph.D., an assistant professor of genetics, cell biology and development, University of Minnesota, reported that her group began by looking at structural alterations in cancer genome. “[Of particular interest is the loss or gain of particular segments of the genome that occurs recurrently in cancer,” he notes. “One such region that is of immense interest to us is 8q24, a genomic region often found to be gained in a number of cancers. Dr. Bagchi and colleagues utilized chromosomal engineering in mice to construct three iterations to model: MYC only, MYC plus this surrounding area, and the surrounding region alone. “Surprisingly, we found that MYC enhanced tumor growth only when the surrounding region was included,” Dr. Bagchi pointed out. “This verified that MYC is not acting alone. Finally, Dr. Bagchi’s group definitively fingered PVT1 as the co-conspirator with MYC. The investigators knocked it out of MYC-driven colon cancer cells and found the tumors virtually disappeared. According to Dr. Bagchi, this study complements previous studies and establishes an important finding: Long ncRNA PVT1 interacts with MYC in the nucleus and protects the MYC protein from degradation, probably by reducing phosphorylation of its threonine 58 residue. Given the roles played by ncRNAs in a host of biological processes, it is no surprise that these species also impact prostate cancer progression and therapy resistance. Nonetheless, details of the relationship between ncRNAs and prostate cancer remain to be elucidated, said Dimple Chakravarty, Ph.D., an assistant professor of pathology and laboratory medicine at Weill Cornell Medical College. “Deregulated or aberrant expression of steroid nuclear receptors are linked with cancer progression and thus are also major targets for therapeutic intervention,” observed Dr. Chakravarty. “But specific therapies are often inadequate. Dr. Chakravarty and colleagues wanted to better understand the role of the estrogen receptor alpha (ERα) that is expressed in prostate cancers. “Our studies identified an ERα-specific noncoding transcriptome signature. This lured us into the noncoding world,” she disclosed. Dr. Chakravarty and her collaborators, including Mark A Rubin, M.D., a professor of pathology and laboratory medicine at Weill Cornell, scrutinized a combination of chromatin immunoprecipitation (ChIP) and RNA-sequencing data. The investigators found that the most significantly overexpressed and ERα-regulated lncRNA in prostate cancer samples was a transcript called NEAT1, the nuclear enriched abundant transcript 1. Dr. Chakravarty expressed excitement over these findings: “This study is the first of its kind to demonstrate transcriptional regulation of lncRNAs by an alternative steroid receptor in prostate cancer. We believe NEAT1 could serve as both a prognostic marker for aggressive prostate cancer and also a potential therapeutic target. Genetically engineered mouse models of human cancer have been indispensable in dissecting the molecular mechanisms involved in tumorigenesis. They also provide powerful platforms for preclinically studying drug sensitivity and resistance, said Andrea Ventura, M.D., Ph.D., a cancer biologist at the Memorial Sloan Kettering Cancer Center. In one of the group’s studies, the CRISPR/Cas9 system was used for in vivo engineering of oncogenic chromosomal rearrangements. The group studied a specific type of lung cancer that previously had been challenging to model. But there are many challenges that must be addressed when using this new technology to create genetic models. “If we want to study human microRNAs, it is easy and straightforward to knock out their equivalents in mice, as they are well-conserved across species,” remarked Dr. Ventura. “However, the challenge with lncRNAs is that most have poor sequence conservation, and it is often difficult to identify the murine counterpart of a human lncRNA.